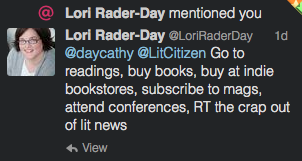 Those are some great ideas for how to be a literary citizen! Not to mention a super cool way to handle the Twitter challenge. It’s great to see that people are participating and helping advance our list. What a cool community to be a part of, and age to live in when such communities and means of communication are possible. Can you imagine trying to do the same thing via telegram? This was really encouraging to see and I hope that my week with this challenge goes as well–and as rad–as yours and Haley’s!! 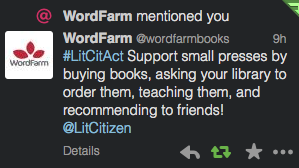 Here’s what happened when I put my students in charge of the @LitCitizen account.